Not sure if a project like this is acceptable here, but here goes. 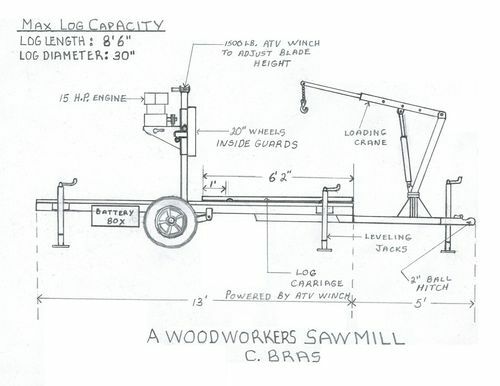 I have wanted to build my own design of a home built band sawmill for as long as I can remember. Last summer I finally got to it. I have little need for construction length lumber. My desire is for shop project wood. For the occasional need for stud length lumber I set my maximum length to 8’6”. This will allow me to use a traveling carriage rather than a traveling arch and still limit the trailer to 18’ including the towing A frame. Here was the initial concept drawing, I like to build by the seat of my pants, according to the many salvaged parts I have collected over the years, so there is not alot of detail, but the main features are listed. All finished except for paint, ready for a test run. First log loaded on with the built in hoist. A lot easier than hydraulics. Cutting a board off of a squared up Birch log. How accurate is it? Thats a 1/16” slice of Birch veneer. Could have gone thinner still lots of strength. 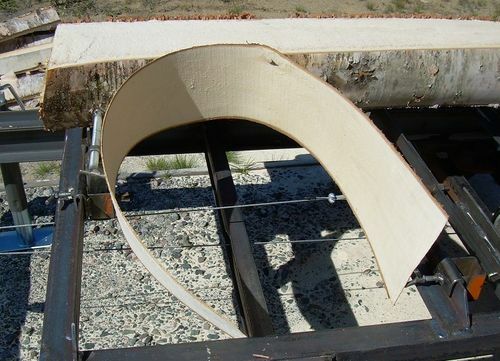 Not bad for a first test run, a little less than 200 board feet. 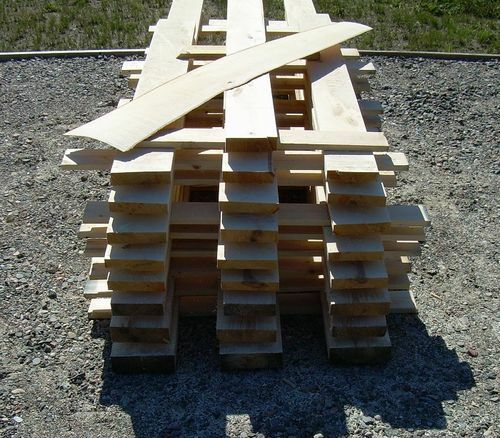 Bottom thicker boards are Poplar and Spruce, more than half are clear Birch. All done, ready for paint. After my test run winter came early and I didn’t get a chance for paint. The plan is to get the paint on as soon as the weather warms up again and then there is a big pile of lumber I want to saw this summer. This was a very long build with close to 300 pictures. If you would like to see the full build here is the link to my build page on my blog. This is just so awsome! Congrats on areally nice build! Amazing job and impressive sawing capability. I read your post – I was blown away that you have actually BUILT the thing !!! that is simply awesome and very worthy of every praise you receive on it. all the best and hope it serves you well for many, many years. Thank you for the kudos everyone, it was a project long in the back of my mind. The results were great, we’ll see how it holds up this summer. Well I have to say i am jealous! Great job! I always enjoy watching lumberjack/logging shows on TV. I picture my retirement involoving something like this maybe on a smaller scale. Thanks for sharing! Man that’s awesome. That’s the type of project that is excepted here along with a lot of excitement and praise cause that machine is awesome. 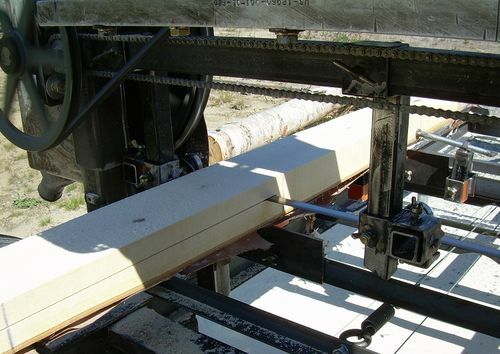 That’s a really well designed and, obviously good working saw mill! Nice job, start to finish. I am sure others are going to want you to make them some too. GOOD LUCK on a fine machine! Many of what we now consider normal things were made because someone saw the need. The first “Bobcat” skid loaders were built on a farm near Foxhome MN because the turkey growers wanted a more nimble thing than a loader tractor for cleaning the barns. It had also to light enough to be usable in the converted hay lofts that were being used for raising turkeys. The problem landed in the capable brains of Cyril & Louis Keller; the rest id history. Evolution took the original 3 wheel design to short tandem and now eventually to semi- tracked and full tracked skid loaders. The Kellers sold the patent eventually to Melrose that was a ND agricultural manufacturer. Then it was purchased by other companies and became a worldwide; extremely versatile use machine. 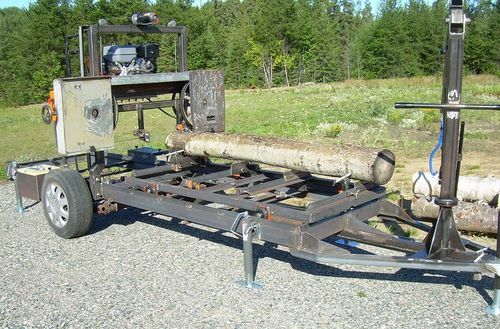 Now many manufactures make very similar machines, from small enough to fit in a pickup box to huge enough to use logging. I have driven and worked with several of these machines and marveled many times about how wonderful and usable they are. We even have one of the very small ones. It has a small 2 cylinder Honda engine and over tire rubber tracks. It is capable off fitting through a garden gate and is also able to slug right through mud that walking through is a problem. It is fully hydraulic using hydraulics for everything. It has since this picture was taken been totally gone through. New engine and a total new look—grey powder coated. The only way to really appreciate this machine is to have used it. 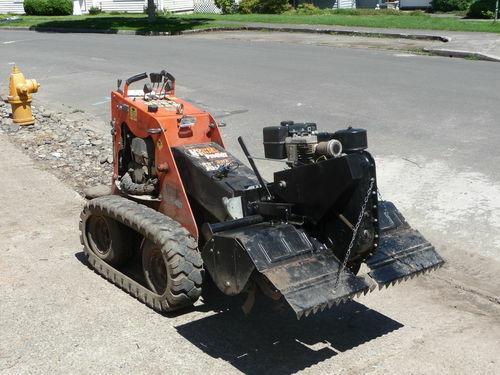 The attachments that we have for it are, bucket, carrier, trencher, post hole digger—Can dig 4 ft deep with the adapter that I made, a trailer hitch receiver to put trailers in tight spaces, and the roto-tiller that I had adapted to it. What did you use for wheels? Hi rws, I had a Chevy Cavalier that I was ready to scrap, I documented on my blog where I took it apart salvaging everything I had potential use for, leaving only the sheet metal, glass, foam and fabrics to haul to the scrap yard. 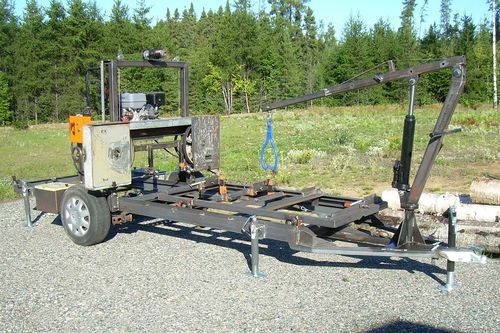 I removed the wheels and rear axle complete and sized the saw frame to accept it. 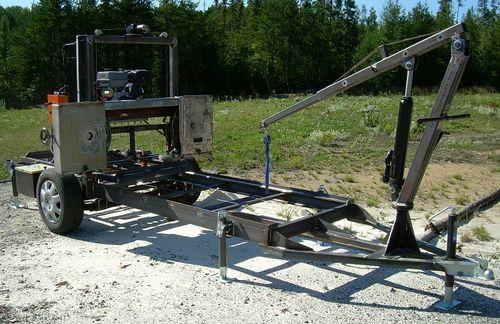 By removing the shocks and rotating the frame parallel to the ground, the saw frame runs low to the ground, making for easier log loading. Fabricated the front mounts to match the Cavalier and bolted the rear shock mounts to the saw frame with 1” thick hard rubber gaskets to avoid metal to metal contact. Maybe more info than you wanted. Looks like a good machine. I’ll check out the blog. Congratulations on an EXCELLENT design and build. GREAT MACHINE! You can probably pick up some side work milling for others as well. OUTSTANDING! Thank you for sharing this with us. Way cool, and I’m definitely jealous.